"Great product, great price, timely shipment. Just perfect." My Grandma's of New England's Coffee Cakes define traditional coffee cakes. These cinnamon walnut coffee cakes are based on a rich egg and sour cream coffee cake batter with additional distinctive flavorings. The My Grandma's Cinnamon Walnut Coffee Cake Value Collection includes three one-pound twelve-ounce Cinnamon Walnut Coffee Cakes. Coffeecakes stay fresh on the counter for a week or can be frozen up to four months. Excellent value-three Cinnamon Walnut coffee cakes for the price of 2! Enjoy our baked in the USA cakes! 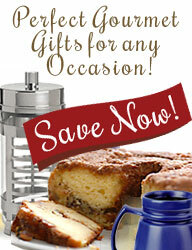 Get three of our best selling coffee cakes for the price of two! CoffeeCakes.com Traditional Cinnamon Walnut Coffee Cake Value Collection includes three of our best selling one pound, twelve ounce signature cinnamon walnut coffeecakes. Coffeecakes stay fresh on the counter for a week or can be frozen up to four months. These cakes are trans fat free and do not contain any artificial coloring, artificial flavoring or preservatives and make great gifts for giving and entertaining. Excellent value - three Traditional Cinnamon Walnut Coffee Cakes for the price of 2!